I think I should start my story at the beginning, and tell you a little about myself. I graduated University of Delaware in 1994 with a Bachelor of Arts in Computer Science and a music voice performance minor. My areas of study meant I was pretty good at computers and getting up and performing in front of a crowd. I did that for years teaching the fundamentals and internals of Windows desktop management. Geeky, boring stuff, right? Well, not to me. I loved it so much in fact, that I created some software that hooked into what was in the box from Microsoft to make it more awesome, which is my security and desktop management software, PolicyPak. 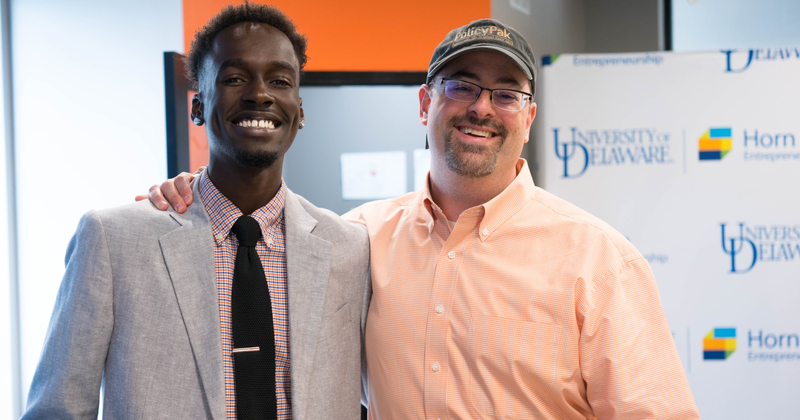 I had started with Horn Entrepreneurship as a preliminary judge for the Hen Hatch competition, which I explained to my friends is like Shark Tank for UD students, alumni and faculty. In that program I was able to give my feedback on business ideas’ feasibility to take off and make it big time. A lot of the ideas had legs, and many of the startup ideas I helped give feedback to in Hen Hatch moved on, and one of my picks even won the competition! When Horn Entrepreneurship asked me to be a Philanthropic Investor in the Summer Founders program, I wasn’t sure what would be involved. First: it had nothing to do with taking out my checkbook. The Philanthropic Investor’s job in the program is to help mentor and advise the startup teams. The teams only have 12 weeks, so they need to quickly bubble off anything that isn’t needed in their idea, so that only the best ideas survive. Pivoting is the name of the game in the Summer Founders program, and the teams did a great job of keeping the kernels of their ideas, doubling down on what worked, and gutting the stuff that wasn’t working, or couldn’t be implemented in 12 weeks. As an advisor to the Summer Founders program, I was tasked with helping teams with Tuesday Mentoring and Friday Judging. The Tuesday Mentoring meant I could work with teams’ ideas, plans and whatever implementation details they already had, and give them immediate feedback. Some teams had super-focused strategies, technologies, and even some customers. This progress enabled us to get down to business and get focused immediately. I was able to give advice on how to hire coding freelancers and designers. I also helped hone in on messaging and tone, and even helped one team get working on an end-user experience mock-up and walk-thru of their product via wireframe software. The Friday Judging was about seeing how far each team was able to come from the last time the advisors saw them. I didn’t see every team every Tuesday, so seeing them on some future Friday was always a surprise to see where they headed since the last Tuesday mentoring session. Every Friday, the teams would show their pitch deck, as if we were to invest in them. How viable is the idea? How big is the need? What connections have they made? For the students, getting feedback on the spot about what parts of their pitch worked, and which parts fell flat, enabled them to dust off and re-tune. The layout of the alternating days helped the students grow, and it was evident in their pitches on Friday Judging sessions. For me, watching the teams transform week over week was by far the best part. Each team was trying to juggle the demands of “real life” alongside their newly born business, trying to make their first sale, plus learning what it’s like when team members were and weren’t available during the process. For me, I wanted to ensure that by the time the 12 weeks were over they could confidently get their first handshake agreement with a partner, or, better yet, a paying customer (if they didn’t have one already). The spirit of the event has moved me to set up my own scholarship for entrepreneurs. I want to announce that I’m starting a bi-annual scholarship for anyone with an entrepreneurial idea focused on how to make the world more secure. You can find out more about that here. All the teams grew their ideas and moved forward during the 12-week program. Watching it all happen was a reward in itself, and I hope to retain the honor of being part of the Summer Founder’s Philanthropic Advisors team again in 2019. Jeremy Moskowitz is founder of MDMandGPanswers.com and PolicyPak Software. His latest book is "Group Policy Fundamentals, Security, and Troubleshooting, third edition." GPanswers.com was ranked as one of "The 20 most useful Microsoft sites for IT professionals" by ComputerWorld magazine.